Today—Oct. 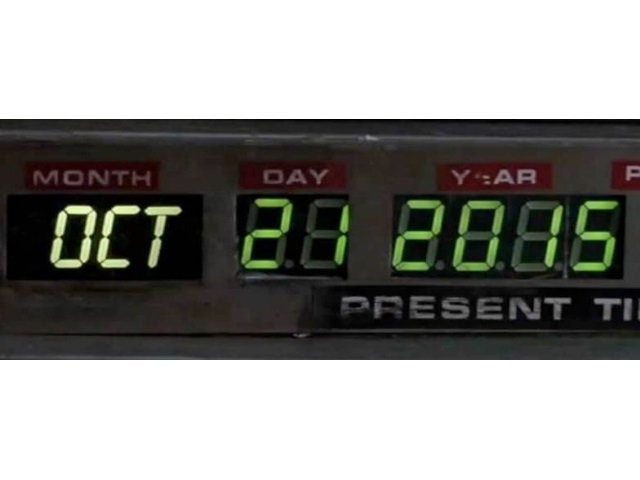 21, 2015—is the day Marty McFly and Doc Brown arrive in Back to the Future Part II, and related events are burning up Facebook like a flux capacitor. Facebook said in an email to SocialTimes that more than 1 million users have joined more than 6,200 events with Back to the Future themes, including outdoor screenings, costume contests, hoverboard photo opportunities, trivia, cover bands and 1980s dance parties. The Back to the Future Day Block Party in Bellingham, Wash., will feature an outdoor block party, indoor screenings, 80s trivia, a costume contest, a DeLorean, local bands and a Back to the Future musical. The Back to the Future Double Feature in Indianapolis: an outdoor screening, food from food trucks, inspired games, activities and photo opportunities with a hoverboard. The Back to the Future: Welcome Marty Party in Houston will feature an outdoor screening, costume contest, a hoverboard “show and tell” and a DJ playing 80s music. Back to the Future Day in Mays Landing, N.J., will include a large event inside the mall with a large inflatable screen to play the film, a cosplay Marty and Doc along with a replica hoverboard and a DeLorean. The Come Back to the Future Vintage Party in Tampa, Fla., will include performances of bands inspired by the film and a costume contest. Back to the Future Day in Torrance, Calif.: Smog City Brewery is hosting an 80s-themed celebration complete with a triple IPA (in the spirit of the trilogy). Back to the Future I and II Screening in Toronto will feature screenings, a costume contest and an “Enchantment Under the Sea” dance. Back to the Future 2 Bash in Oklahoma City will feature a party at Main Event encouraging people to dress in costume while playing bowling, laser tag and more. Back to the Future Party at West End in Sanford, Fla., will show the entire trilogy and a guest DJ will spin 80s-themed music. Back to the Future Experience in Lafayette, La., will feature a selfie station featuring a DeLorean, an Enchantment Under the Sea photo booth, a costume contest and an 80s tribute band. Back to the Future 80’s Dance Party w/Once in a Lifetime!!! in Birmingham, Ala.: An 80s band will spin tunes at Stillwater Pub. Back to the Future Party at 1984 in Springfield, Mo., will include a costume contest, selfie scavenger hunt, prize contest and an actual DeLorean. Readers: Do you plan to attend any Back to the Future-themed events?